Usher: "I really want to make a statement about the importance of voting; one that resonates and connects with people!" Person One: "That's great that you're making a political statement! 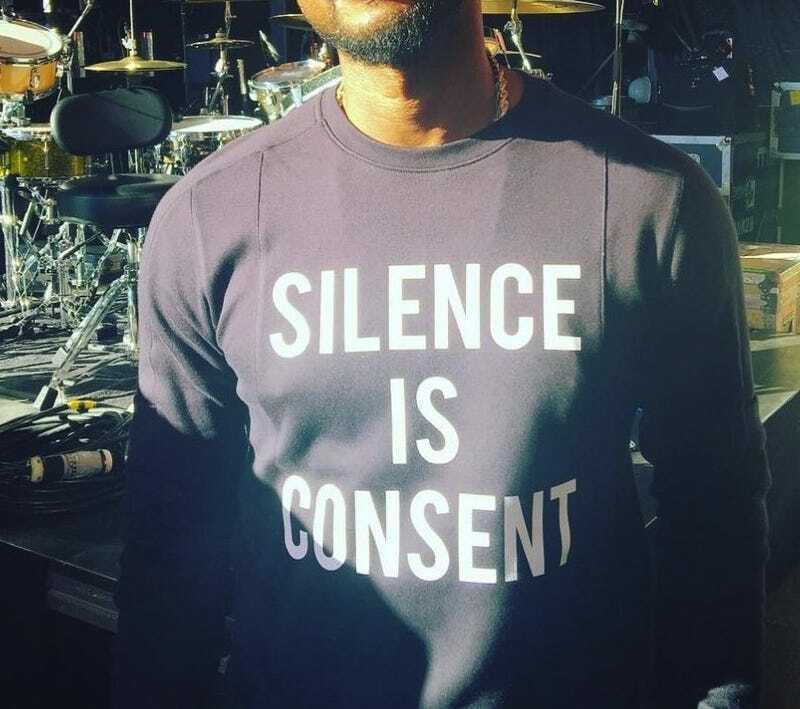 It's definitely necessary, and with someone with your platform and influence, it'll…"
Usher: "So I took the liberty and had this sweatshirt made through Teespring! It clearly communicates the message I'm trying to convey, which is that remaining silent during political times is a way of co-signing wrongdoing." Usher: "What? You think I should have gone with a bolder color, huh? Maybe a red shirt with white letters. I'll do that the next time." Person Two: "Umm…that's not really it. I…just…I…"
Usher: "OHHH! You know what would be great? A camo consent shirt. Just to evoke that this is a battle. A war! And we can't afford to take no for an answer." Person Three: "So, we love the idea man — your heart is definitely in the right place — but we collectively think you can come up with an even better slogan. Like 'Go Vote, Man!' Or even 'Vote Or I'll Kill These Puppies.' Or literally anything other than the slogan on that shirt. So let's go back to the drawing board and brainstorm a bit before we do anything publicly." Usher: "Nah, this slogan is fine. It's direct and to the point, it uses words that people understand, and on a sweatshirt it looks good with Levi's. And Jesus appeared in one of my dreams yesterday, and told me it would change lives. Plus, I already posted it on Instagram a half hour ago, so now we just have to figure out different color schemes for more sweatshirts. I really like the camo idea. Maybe even camo polkadots, so H&M can carry them. We still have connects at H&M, right?"